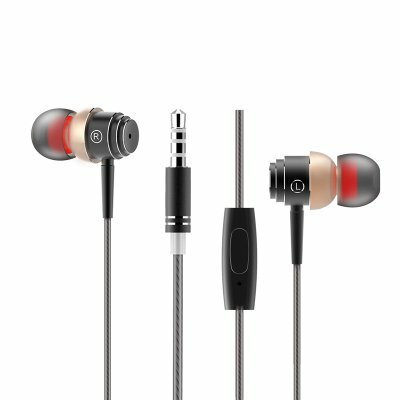 Successfully Added Elephone E1 Earphones - Noise Isolating, Aluminum Design, 3.5mm Audio Jack, Built-in Mic, 3 Size Ear Plugs Included (Black) to your Shopping Cart. Enjoy audiophile grade music quality at any time of the day with the Elephone E1 earphones. Featuring noise isolation technology these stylish earphones allow you to listen to your favorite tracks in stunning quality without getting interrupted or distracted by the noise generated by your surroundings. Coming with 3 different size silicone ear plugs the Elephone E1 earphones are guaranteed to fit any size and shape ear out there – making these stylish headphones the perfect accessory for young and old. Well crafted, these earphones feature an absolutely astonishing design that is a true feast to the eye. Its aluminum alloy body gives these earphones a stylish and high-end look while simultaneously making them more durable. An oxygen-free-copper core wire has been used to reduce interference and has been placed within a stylish coating in order to finish the earphone’s high-end design. Coming with a universal 3.5 Audio Jack these headphones are guaranteed to fit on the majority of electronic devices out there. Featuring an intergraded microphone these earphones do not only allow you to listen your favorite tracks in stunning beauty, they also allow you to make hands-free calls while in the car or exercising. Additionally, the volume of your music can be controlled easily via the cable so from now on you can leave your phone in your pocket while adjusting the volume of your songs. With its precise bass technology these stereo earphones are guaranteed to deliver absolutely stunning sound quality – making the Elephone E1 headphones the perfect accessory that will help you enjoy your favorite music where ever you are. The Elephone E1 earphones come with a 12 months warranty, brought to you by the leader in electronic devices as well as wholesale electronic gadgets..